Our Learning Lodge at Pimp Hall Nature Reserve in Chingford may be ‘Off The Map’ of the E17 Art Trail (3-18 June) but we’re still well and truly in it and being very, very arty! (Find us in the Guide as ‘OTM b’). We think we’ve got the most beautiful space for art, and will be making good use of the Pimp Hall Nature Reserve where our Learning Lodge is based. Thurs 1 June, E17 Art Trail Preview Night from 5:30-8pm for ‘Artogether’. We have a photo exhibition from Nicky Bamber Photography, with pictures by the local Church of England school pupils. 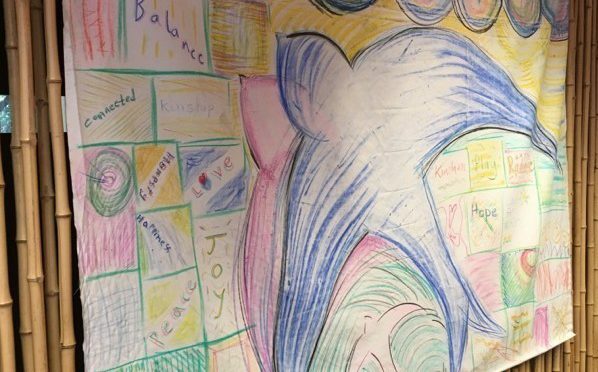 Art Commune adults class has filled our walls with colour, and Chingford Life Drawing will share their experience and skills. Sat 17th June, open air, Life Drawing class in the nature reserve with clothed model, 10am – 4pm. Suitable for all ages. Plus authentic Mexican food from M for Mexico pop-up!! Saturdays 3rd & 10th June, 12-5pm. The exhibition is always on during Art Commune class hours, Tuesdays 10am -5pm. Wednesdays and weekends 11am -5pm. Take your pick and join us!